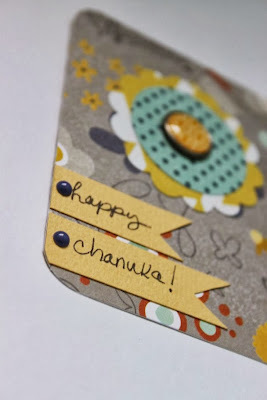 Now that my Chanuka projects are up on the My Mind's Eye blog, I figured I'd share them here with you as well! Check out the original post for more details. 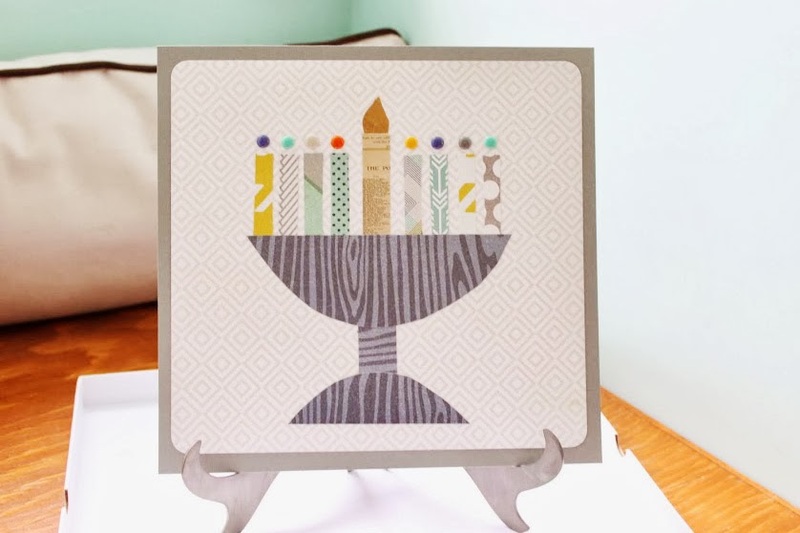 First up, my favorite project--a menorah decor piece. Who knew enamel dots worked perfectly as candles? 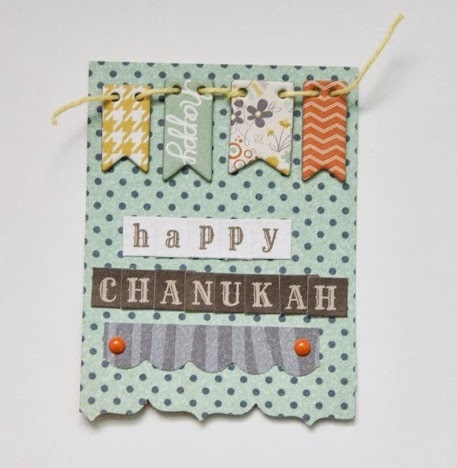 I just paper pieced this one out of patterned paper and a bit of gold foil. Easy and fun! Next up, we have a card with a paper pieced dreidel. Again, handdrawn, homemade, simple and charming was the name of the game here:) Loved finding creative ways to use the MME Lost and Found brads! 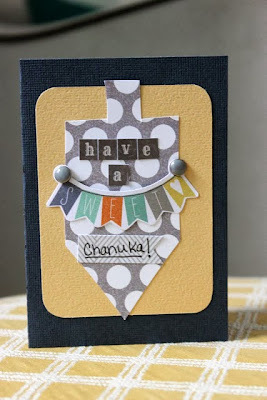 A gift tag for presents--LOVE layering scallops and circles into flowers for tags! And another tag, with the cutest little banner stickers! Finally, my layout. 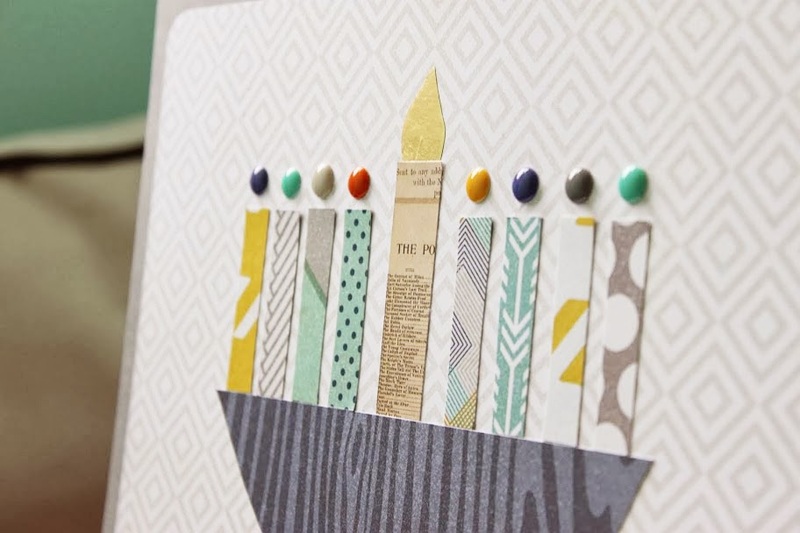 I kept the design simple with a washi tape and patterned paper collage on the left, and plenty of white space on the right. I have a tradition of creating a layout each year on Hannukkah documenting where we are at in our life. 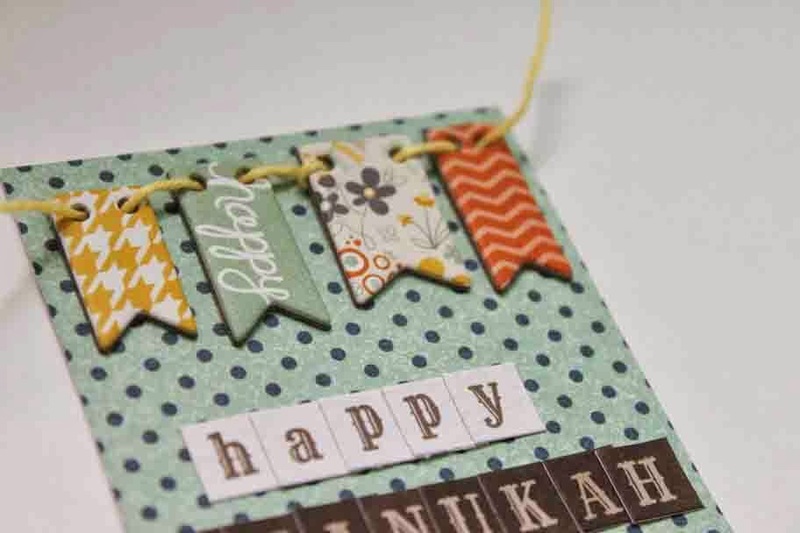 On Hannukkah in 2010, we were dealing with infertility and having a hard time fully celebrating the holiday. In 2011, we were expecting our first baby in just a few months and full of eager anticipation. Hannukkah of 2012 found us enjoying the day with our nine month old baby girl, who was mostly excited about the wrapping paper! Now, in Hannukkah of 2013, we are enjoying having a twenty-two month old who “gets” the holiday more and more, as well as baby #2 on the way! I love doing these yearly comparisons on Hannukah in particular. 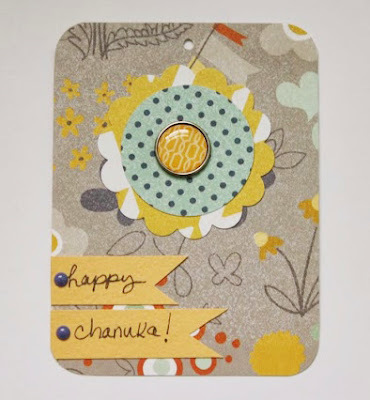 And those are my Chanuka projects! 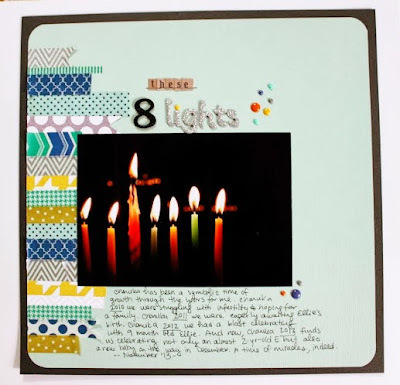 I love how a guest posting project "forces" you to get in your scraproom and whip things up you wouldn't have taken the time to do otherwise. Sadly, today is the last day of Chanuka so I'm glad I got the fun in while I could! Tell me, what are YOUR favorite holiday traditions this time of year! Such pretty projects! I love the idea of enamel dots for the flames. I got a great shot of my daughter's ballerina barre menorah all aglow last night so I'll be scrapping that soon. I guess one of my favorite holiday traditions is picking up the christmas tree, listening to christmas carols in the car on the way there and back and of course taking all the nice ornaments out the boxes and decorating the tree. 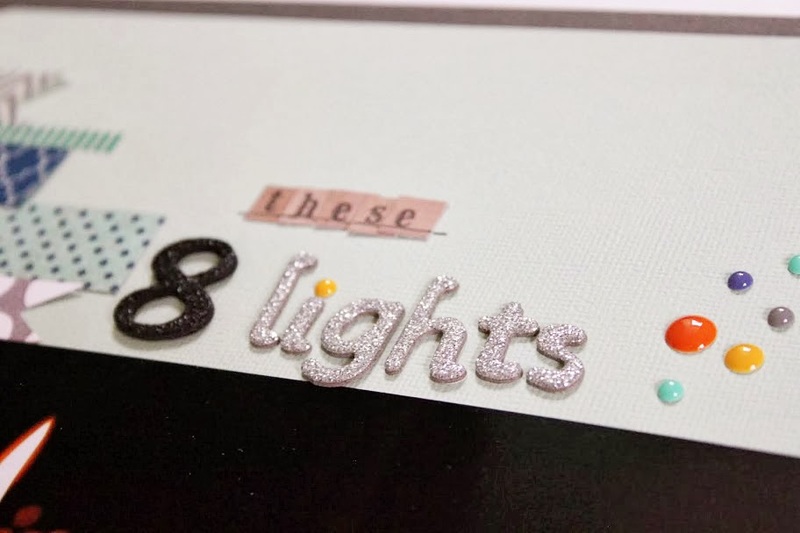 First off, love all your projects, the washi, the banners, the enamel dots for candles. All totally fab. And totally love your comparison page and details. Enjoy those little ones all you can and congrats on the coming birth. I love your idea of doing a comparison page on a particular day each year. Very inspirational. Fav holiday traditions are about the time with my family for me. There are certain things we do and don't get to every year. I love spending time with them and not worrying that we've not had time for .... yet. But I try really hard to make sure we get a story in on Christmas eve. So I guess you could say that's my fav.